Honda Cars Philippines, Inc. (HCPI), Honda’s Automobile unit in the Philippines, invites customers to visit and see Honda’s exciting line up of vehicles at Honda’s display event at the SM Mall of Asia Atrium starting today until July 27, 2017. The week-long event showcases the refreshed New Jazz 1.5 RS Navi, New Mobilio RS 1.5 RS Navi, New City 1.5 VX+ Navi, and the Civic RS Turbo where the customers can check the vehicles up close and get special offers upon visiting. 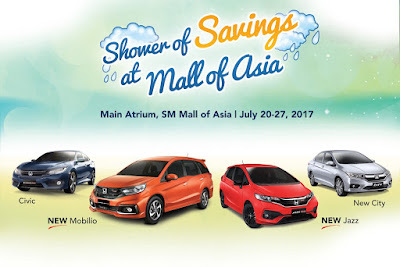 Customers who will visit Honda’s display event or any of the 36 Honda Car dealerships will get an extended opportunity to get their dream Honda vehicle as Honda will provide customers outright cash discounts this month of July. To make this month a more enjoyable purchase experience, new Honda Vehicles will be offered with low down payment schemes, special limited accessory packages, and bank financing promos. Customers may get the 2018 New City 1.5 E MT with as low as P 51,000 down payment scheme. Interested BR-V and Civic customers may also avail of the best deals this month, as the All-New BR-V 1.5 S CVT and New Civic 1.8 E CVT will be offered with down payment as low as P 63,000 and P 77,000 respectively. CR-V customers will also choose a special limited package between a Modulo Aero Kit and a Modulo Trekker Kit accessory package. Aggressive marketing, but they don't have any units for Civic in manila.